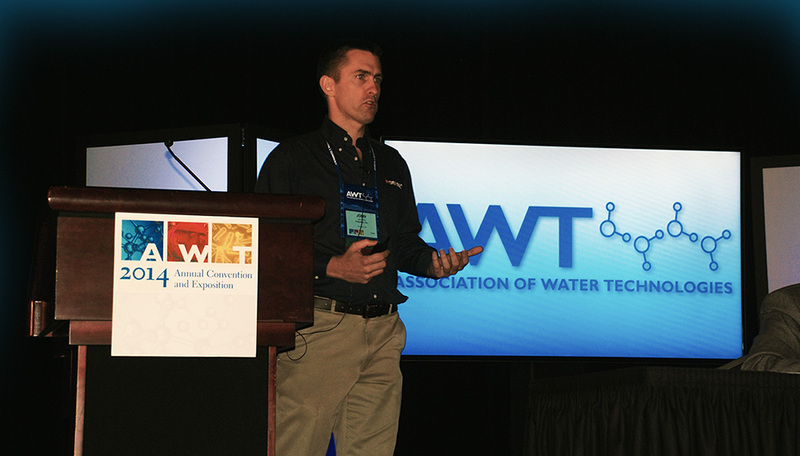 Chlorine Analyzer Presentation Given at AWT Annual Conference in Texas | Chemtrac, Inc.
John Clark, Chemtrac VP & GM, presented a technical paper, Understanding On-line Amperometric Chlorine Measurements (pdf download), at the 2014 AWT (Association of Water Technologies) Annual Conference and Exposition. The event was held October 28 thru November 1 at the Convention Center in Fort Worth, Texas. The presentation included an overview of chlorination chemistry and chlorine measurement; a chronological evolution of the amperometric chlorine analyzer; a guide to selecting an appropriate chlorine analyzer; and a case history where the EPA “Method 334.0: Determination of Residual Chlorine in Drinking Water Using an On-line Chlorine Analyzer” is being applied in a plant where on-line colorimetric devices (DPD) and amperometric sensors were compared. Chemtrac also had a booth where the CCA3500 Laboratory Charge Analyzer, the PC5000 Portable Particle Counter, Duratrac 4 Streaming Current Sensor, chlorine probes, and HydroACT Multi-Parameter Analyzers were displayed and demonstrated. There were approximately 1000 attendees, consisting of water treatment professionals from throughout the world. The 2015 AWT Conference will be held in Nashville, Tennessee next September.